Love this photo. Jake May of MLive captures the "warm rapport" Lt. Gov. 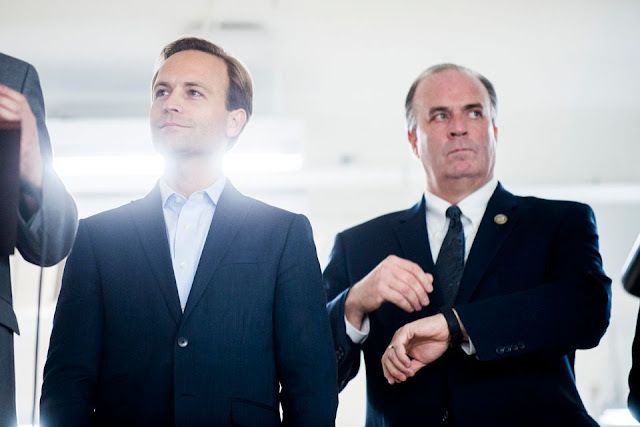 Brian Calley, left, and U.S. Rep. Dan Kildee, D-Flint Twp. must share with each other with this photo taken at the grand opening of the Ferris Wheel building on Saginaw Street in downtown Flint. You don't have to be a body language expert to figure this one out. On a side note, I'm with Kildee on the clothing choice. If you're going to wear a suit, wear a tie. Otherwise, why bother?